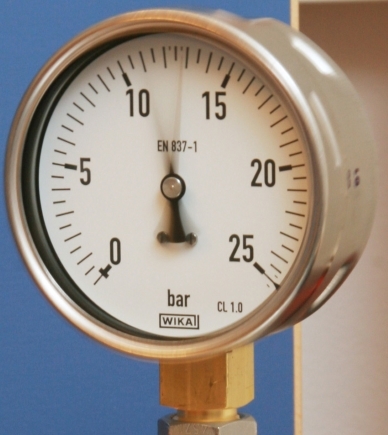 Liquid-filled pressure gauges are used in applications that involve high dynamic shock and vibration loading. The filling liquid dampens the vibrations that occur and thus takes the load off the mechanical components of the pressure gauge. Depending on the operating conditions, glycerine-water mixtures or silicone oils are the most frequently used filling liquids. Glycerine-water is suitable for the majority of applications and ambient temperatures. Particularly for low pressure ranges, it makes sense to use it, due to the low density of the liquid and the associated low resistance on the pressure element. Silicone oil is primarily relied upon when the pressure gauge is exposed to particularly high (> +60 °C) or very low (< -20 °C) temperatures. The case of the pressure gauge is not completely filled, since, depending on humidity and ambient temperature, the filling medium absorbs additional water and expands accordingly. To provide sufficient space for this expansion and to prevent the case from leaking, the case is only filled to 80% – 90% by default (see Figure of model 213.53). The filling liquid dampens any pressure peaks, shocks and vibrations that occur and protects the mechanics of the pressure gauge. Thus, material fatigue and malfunction is counteracted. A further factor – decisive for the user – is to ensure the readability of the prevailing pressure. The filling liquid causes the pointer’s motion to be limited, even under severe vibration loads. Without liquid damping, the pointer would not show the actual applied pressure, but rather move to and fro in relation to the frequency of the vibrations prevailing in the application. In the event of resonance, a deflection angle of over 180 ° could even occur. 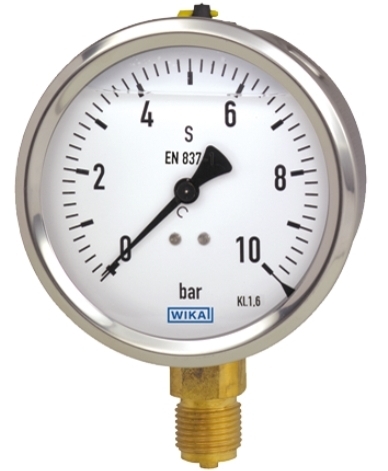 Liquid-filled pressure gauges are suitable for a variety of applications, specifically processes involving shock and vibration. Should you need any further help or advice for your specific application, your contact will be glad to assist you.